Why a successful mission to Mars will need humans to become cyborgs. If immortality is the Holy Grail of Futurism then the colonization of Mars is its Holy Sepulchre—a big empty tomb. Both attract their pilgrims: the former is a fairytale; the latter is a real place just out of reach, a sort of tantalizing inspiration to hungry dreamers everywhere salivating for land that doesn’t belong to them. These days, from the promises of Elon Musk to the heroics of Matt Damon, we positively fetishize Mars. Yet my advice to the 11th century crusader and the 21st century Martian colonist would be the same: tend your own garden. I’m afraid that this is blasphemy from someone who calls himself a Transhumanist. After all, the colonization of space is tangentially connected enough to other themes associated with technological progress that they’re ordinarily all lumped together under the general banner of Futurism. In an increasingly divisive political climate, the promises of SpaceX and Mars One shine like the hope of some long-awaited escape from ourselves. We might not have cities on the moon, but the fruits of space programs enrich our lives immeasurably. More fundamentally, the allure of space colonization is at the heart of some of our most beloved cultural narratives, shaping the aspirations of explorers since the first days of NASA and the Soviet Space Program. Even the earliest films lionized astronauts. The moon landing was the greatest collective lived experience of the twentieth century, this perfect human achievement more majestic than the pyramids and just as pointless only to the cynical. Today, we might not have cities on the moon, but the fruits of space programs enrich our lives immeasurably. And given our recklessness when it comes to the fragile environment of this planet, perhaps we could use another world as a backup, just in case. We already have the technology to achieve the goal of getting to Mars, though for a perfect storm of reasons, it has yet to happen. But isn’t getting there a worthy goal? And won’t the journey there (and not only the physical journey, but the technical refinements forged along the way) benefit the cause of Progress with a capital P? Then what the hell am I complaining about? My intention here isn’t to trash space exploration or regale you with clickbait about the top eleven reasons why the colonization of Mars would be a tragic mistake at this juncture in time. However, I want to seriously problematize the prospective colonization, if you’ll excuse a word that academics tend to overuse. I don’t want to focus on the hackneyed and frankly shortsighted idea that the money spent on getting to Mars could be better employed for services here on earth. My critique has to do with the repercussions of contemporary attitudes about the seemingly unrelated topics of imperialism in outer space on the one hand and Transhumanism on the other. Cultural prejudices enshrining heroic astronauts blazing across the sky and mad scientists forging abominations pose serious problems for Transhumanists of all stripes and would-be Martian colonists alike. If the predominant image of space colonizers enshrined in our zeitgeist is heroic pioneers soaring across the galaxy in the name of science and adventure, the narratives surrounding genetic engineering and cyborgs are positively apocalyptic by comparison—just think of Frankenstein, the Terminator, and GATTACA. Somehow, an astronaut’s 400 million kilometer journey from Earth to a theoretical outpost in a faraway wasteland seems less terrifying than a head’s four-meter journey from its body to a theoretical apparatus capable of supporting its consciousness. The reasons for this difference in our intuitions are varied. They partly have to do with the genealogy of our ideas about imperialism in outer space, which are grounded in discourse about the benefits of the exploration and exploitation of underdeveloped foreign lands, exotic travelogues, Cold War propaganda, epic films, etc. They also have to do with the attitudes that surround Transhumanism, grounded in skepticism about discredited fields like galvanism, the abuses of the eugenicists, deep-seated fears surrounding physiological dislocation and dismemberment, etc. The end result of all this discourse is that, right now in the popular imagination, would-be cyborgs are monsters and would-be Martian colonists are heroes. Let’s take it for granted that the exploration of Mars would provide net benefits for society at large. Nevertheless, whether from the vantage point of someone who wants to investigate Mars and preserve its landscape (let’s call this the environmentalist perspective) or someone who wants to colonize and terraform it (the imperialist perspective, which incidentally seems to completely dominate the environmentalist one), the problem inherent in this tension is immense. First, imagine you were an environmentalist who felt strongly against the radical transformation of Mars. Your reasons might be varied. To you, the urge to dominate nature with the clutter of terrestrial civilization might seem arrogant and intrusive. True, there are no indigenous Martians to despoil. But the process of terraforming the planet’s surface would still seem to be hugely rapacious. Imagine drowning its pristine scarlet valleys in water and clouding its translucent atmosphere with chemicals. Wouldn’t even the most single-minded developer preserve some of the planet’s original landscape rather than transform it all? Doesn’t this intuition concede that there is inherent value and beauty in the wild state of the place? If advanced aliens exist within visitable distance of our planet, they are evidently the type to silently observe or ignore us rather than actively intervene in our affairs. How primitive it might seem to them that our conception of space travel in 2017 is still bound to the small-minded earthly impulse to barge in, dominate nature, and claim random parcels of it as our own. From this perspective, the only visits to Mars should be undertaken for the sake of exploration rather than colonization. The best agents to do so would be robots and cyborgs rather than unenhanced human beings, whose imprint on the environment would be immense by comparison. Yet until the development of cyborgs, we are doomed to either only know Mars indirectly or permanently scar its landscape as successive generations of pioneers perish on its inhospitable surface. Now, consider the imperialist perspective. To you, between climate change, nuclear war, plague, and pestilence, the existential threats to human civilization are great enough that you feel we need to colonize Mars as soon as possible or face the potential extermination of civilization as we know it. The preservation of the beauty of nature is all well and good, after all, but human interests come first. Yet the conditions on Mars for the colonizers would be like something out of Dante; indeed, the first Martian immigrants should be “prepared to die,” warns Elon Musk. As it is, we can’t even control the weather yet here on Earth, let alone create a colony on another planet with an inhospitable atmosphere. The bright eyed and bushy tailed original colonists would be like Joseph Conrad’s Mr. Kurtz, fantasizing about the march of civilization but ending up the lonely dupes of capitalism wallowing in lunacy in a dark place where they shouldn’t have ventured in the first place. On closer reflection, the imperialist would realize that until it became feasible to travel to Mars on a mass scale, the original colonies could only remain pitiable outposts for misguided dying settlers and insanely rich tourists rather than anything like a safety net for civilization at large. The fastest and most efficient way to transform the landscape would be by the sweat of cyborgs. And yet ironically, with the advent of cyborgs, the need to terraform the environment to suit un-enhanced human needs would perhaps be moot. Cyborgs and space explorers are entirely akin in their willingness to risk their lives for the sake of challenging the boundaries of conceivability. Yet in 2017, we call volunteers for the journey to Mars heroes, and there are no volunteers at all for brain implants because no doctor would ever dream of performing such an operation or convening a conference to discuss plans for one. 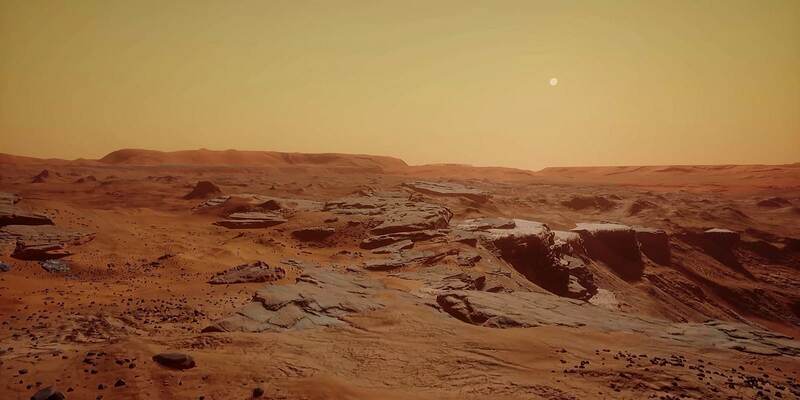 Investment in Mars in the absence of Transhumanism as a vigorous social ideology doesn’t necessarily come at the expense of Transhumanism, but it does come at the expense of the future of Mars. The most widespread current projections of the next century of human development imagine the needs of unenhanced humans predominating as a matter of course. Hence, long-term plans for Mars call for terraforming the planet to create a second Earth. Yet this limitation in our imaginations augurs great brutality and a great deal of human blood spilled along the way as we struggle to dominate conditions not meant for our bodies. This, of course, does not mean I think there should be no exploration of Mars, or even that I am dead-set against eventual colonization. But I would hope that any such colonization would be undertaken in a spirit of great respect for nature, imposing upon it, let alone uprooting it, as little as possible. And I would also pray that the path toward colonization would be blazed with as few deaths as possible along the way. Yet this can only take place after the ascendancy of Transhumanism and not a moment before it. For the time being, I would no more recommend a journey to Mars than I would a voyage across the Atlantic to an ancient Roman armed with nothing but a leaky trireme and his copy of Ptolemy. David Vincent Kimel is a doctoral student in History at Yale. Connect with him on Twitter and Instagram (spqrkimel). Visit his blog at earthasitis.com.